Among the seven sacraments of the church, I can say with some confidence (after 51 years as a priest) that the one most frequently misunderstood is the anointing of the sick. Two weeks ago, I happened to be at a funeral home for a wake service when one of the funeral directors came out of an office and asked to speak with me. He had just been with the son of a man who had died the previous day, arranging the funeral service. He wondered if I would go into their morgue and give the “last rites” to the man, as a comfort to the son. I explained that the sacraments were not administered to those who had already died, but that I would be glad to say a prayer of blessing. He brought me into the morgue, where I did just that — made the sign of the cross on the deceased man’s forehead and asked the Lord to bring him gently into the peace of heaven and to give to his family both strength and consolation. My guess was that the son may have thought earlier about calling a priest but had put it off so as not to “frighten” his ailing father. My guess, too, was that the son had grown up thinking of this particular sacrament as “the last rites” or “extreme unction” and had postponed it until it was too late. In the updating of the church’s pastoral practice after the Second Vatican Council, the sacrament began to be called instead the anointing of the sick. Vatican II was clear that it was not to be reserved only for those at the point of death. So the sacrament is appropriate for anyone whose health is seriously imperiled by sickness or advanced age. While it is never to be trivialized (hay fever, the flu or a torn rotator cuff would hardly justify it), neither should families wait until death is right on the doorstep. 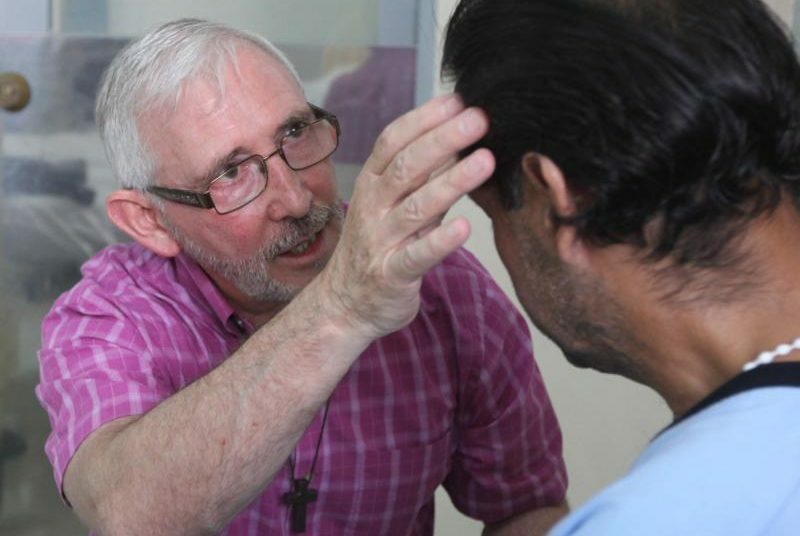 The first purpose of the sacrament is a spiritual one — as well as forgiving sins, it offers the peace and the courage to deal with the difficulties that accompany illness — but it also asks for the restoration of health, if that be God’s will. St. James, in fact, directed in his epistle: “Is anyone among you sick? He should summon the presbyters of the church, and they should pray over him and anoint (him) with oil in the name of the Lord, and the prayer of faith will save the sick person” (5:14-15). Sometimes, as I pronounce the final blessing, I invite the family to extend their own hand in blessing, all of them interceding together with the Lord for the one beloved. Tears may flow freely — but so, I believe, does God’s grace. Father Doyle is a priest of the Diocese of Albany. He is a columnist for Catholic News Service.